From my last update of the Thunbergia mysorensis, and after 3 years, it's curtain call for our Mysore Clock vine (Thunbergia mysorensis). This vine is also called Lady's Slipper and Doll Shoes vine. I've had this vine since 2009 when DH was able to grow the vine from cuttings we picked up from a Visita Iglesia. It was a long wait of around 2 years when its first ever bloom appeared in 2011. There was only 1 flower that appeared in that year. In the following year, 2012, only 2 flowers appeared in summer. That's a total of 3 flowers in the 3 years that the vine was with us. Here's what I considered to finally decide to cut and remove the Thunbergia mysorensis. When the vine was just starting, I assumed that it wasn't aggressive at all. This was because I was comparing it to the previous occupant of the trellis and that was the Princess vine (Cissus sicyoides), sometimes called Millionaire's vine. I was wrong. When the Thunbergia mysorensis vine has become stable and mature, it became just as aggressive. Around 2 or 3 times a year, I'd spent a day or two whacking away thick branches just to keep it tidy. Because the vine grew on a high trellis, I had to use a tall ladder just to prune it - something that my knees didn't quite like. I also had to look for some kind of a deterrent against invasive climbing vines. The Mysore Clock vine's long branches can easily grab and hang on to any object that it can cling to. It would find itself climbing up the telephone wires and all other cables or guy wires within reach. 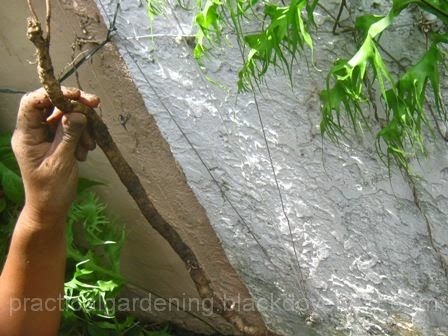 And when a branch has reached the top of the wire, near a telephone or electrical post, it becomes increasingly difficult to cut and remove the branch. 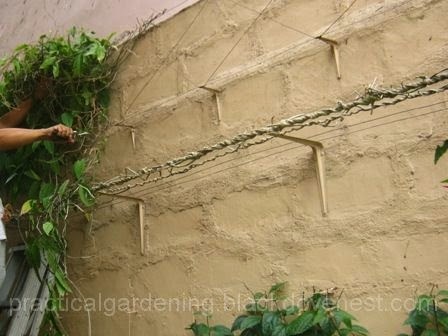 For this reason, I built a homemade vine guard to prevent plants from climbing wires. Occasionally, I'd see references saying that the Mysore Clock vine is adjudged as the "Most Beautiful Vine in the World". Seeing how beautiful the flower racemes are in our vine, that is probably true. But for all the time spent maintaining the vine and waiting for the blossoms, I was disappointed that it would only yield 3 flowers in 3 years. This is 3 years from the time that it was capable of flowering. Was it too little sun? In general, many plants would give their best flowering when they receive plenty of direct sunlight. I must admit the vine's location did not get full day sun. The only time the whole trellis received direct sunlight was 1 or 2 months in the dry season. In the rainy season, half of the vine's total foliage wouldn't get any direct sunlight at all. With its first flower, I tried deadheading what I thought was a spent bloom. After all, for most plants, deadheading to promote flowering is a common garden technique. No other flower came out in that year. In the flowering year, I didn't deadhead and the 2 flowers that came out seemed to have just wilted prematurely. In summary, there was just too little yield for the amount of work done. 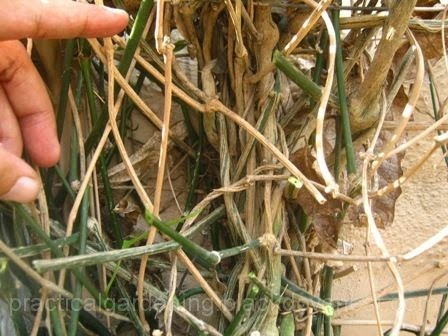 I estimated that it would take me a day or two to fully remove the entire vine - foliage, roots and all. After all, it had a dense growth and was occupying 80 square feet of wall. First, with a pair of pruning shears, I cut all the branches that were leading directly to the high trellis. You'll see the numerous branches, some of them woody and very old, while some are young and still green. As I was still fresh, I started whacking away all the top foliage with the shears. I had to use both arms in cutting away branches. 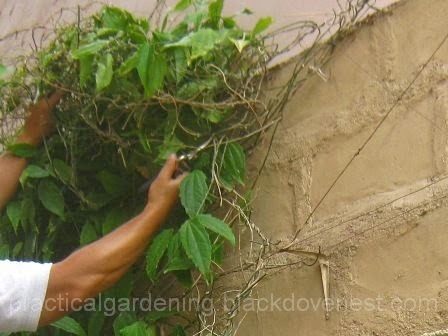 One arm was pushing the thick foliage away and upwards while the other did the pruning. Basically, I was cutting everything other than the trellis wires. All the time, I was on a high ladder to cut all the branches and other foliage. It's tiring and it's one reason I decided to remove this vine. That's an 8-foot high ladder that I'm using. In the process of clearing branches and leaves, I even managed to find a bird's nest with eggs hidden inside the thick foliage! Because of this find, I suspended the cutting of the vine for over a month. 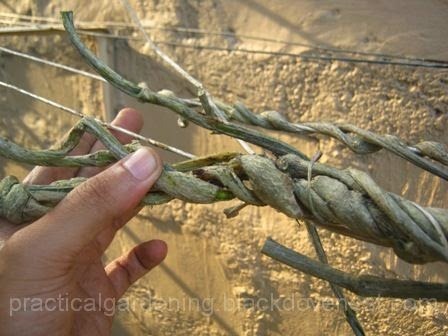 Next, I removed the now thick stems that were coiled to the trellis wires. Notice how the thick the stems are. Some are as thick as my fingers. The older and bigger ones seem to have "devoured" the trellis wires, meaning the wires were inside the thick stems already. Finally, I dug up the vine's roots. 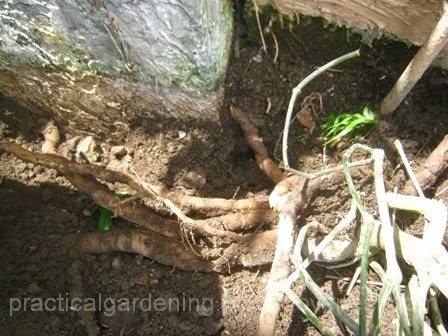 Some of the roots have already gone deep into crevices at the bottom of the concrete wall. Here, I raised one of the main roots that was as thick as my thumb. Just another day of gardening. And how to dispose all of this cut foliage? You could compost it, haul it as garbage, or dispose it with the garden and yard waste incinerator.